With many of the Sarcochilus orchid species being native to Australia, these are naturally either epiphytic or lithophytic depending on species. Many hybrids are offered for sale along with a number of desirable species. Found from Queensland through NSW to Tasmania they are a varied group and have been highly hybridised to produce some spectacular flowers. A popular species in cultivation is Sarcochilus hartmannii (pictured top right), and with its wonderful flowers this is understandable. Well suited to pot culture although in can be grown as a mounted specimen. Sarcochilus fitzgeraldiior the ‘Ravine Orchid’ is another. Sarcochilus ceciliae will take more light than some and the fascinating Sarcochilus hillii with its small intricate flowers is worth a look. And of course the hybrids, readily available for sale. 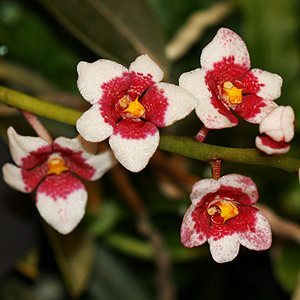 Consider that Sarcochilus orchid are naturally found in the foothills close to the coast, they have a tendency to grow best in the gullies close to streams, cool moist forests. As you can imagine light is filtered at all times and this is requirement in cultivation. You try a 50% shade cloth, heavier in warmer parts. Mounts can be tree fern, cork bark or similar, a medium to heavy pine bark is used in containers. These orchids do grow well in hanging baskets. 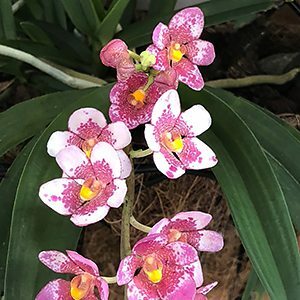 Grown as mounted specimens (best for the epiphytes) with others at home in a pot or basket these orchids like filtered light and regular moisture with a little dryer during dormancy. Fertilizer during active growth and not during winter. Good air movement is essential. Watering should be regular, moist but not wet, less in winter and more in summer. A good flush every month or so will help reduce the salt build up common with most fertilizers. A temperature range from around 8 – 28 C seems to work well, in warmer periods additional moisture will be required to help ‘cool things down’. In nature they grow in spots that would not normally be subject to frosts, so this is another requirement. If you can provide the shade and the moisture you will find Sarcochilus Orchids an easy care and rewarding species to grow. S. hartmannii This is a popular species that flowers from spring right through summer, found from central NSW to Queensland. S. australis is a widespread species found from New through to Tasmania. 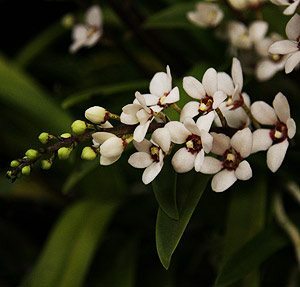 S. falcatus – The Orange Blossom Orchid, found from far eastern Victoria through NSW to Southern Queensland. S. fitzgeraldii Known as the Ravine Orchis found from Queensland to Northern New South Wales.